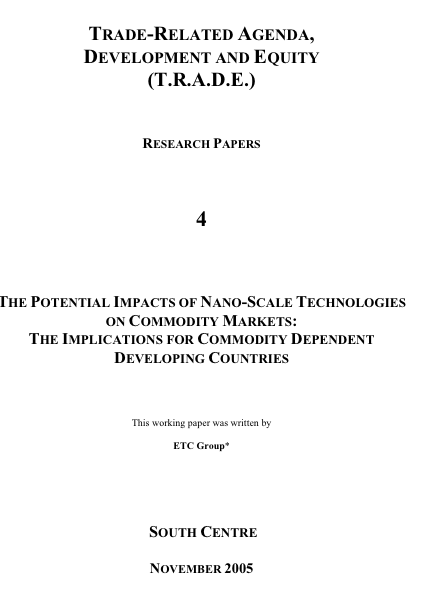 "The Potential Impacts of Nano-Scale Technologies on Commodity Markets," prepared for the South Centre, examines the potential impacts of nanotechnology on two sectors - agriculture and mining - in commodity dependent developing countries. Cases studies on rubber, textiles, platinum and copper provide early examples of how economies and workers in the global South could be affected by nanotech's emerging R&D and products. This report examines the potential impacts of nanotechnology on two sectors – agriculture and mining – in commodity dependent developing countries. Case studies on rubber, textiles, platinum and copper provide early examples of how economies and workers in the global South could be affected by nanotech’s emerging R&D and products. In most cases it is too early to predict with certainty which commodities or workers will be affected and how quickly. However, if a new nano-engineered material outperforms a conventional material and can be produced at a comparable cost, it is likely to replace the conventional commodity. History shows that there will be a push to replace commodities such as rubber, cotton and strategic minerals with cheaper raw materials that can be sourced or manu- factured by new processes closer to home. Nanotech’s new designer materials could topple commodity markets, disrupt trade and eliminate jobs. Worker-displacement brought on by commodity- obsolescence will hurt the poorest and most vulnerable, particularly those workers in the developing world who don’t have the economic flexibility to respond to sudden demands for new skills or differ- ent raw materials.